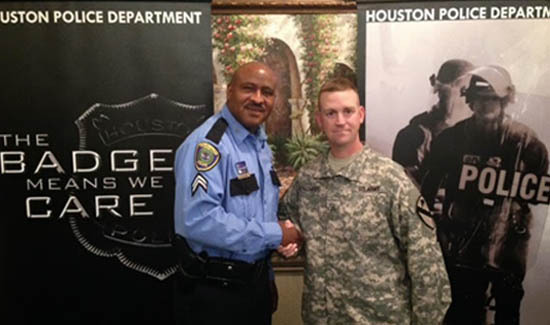 Senior Police Officer Mark Slade is a recruiter for the Houston Police Department. Detroit cops have seen their pay slashed and their retirement benefits gutted as well. The bad news is that it looks like the pain is only just getting started. But the good news is that if you’re looking to hire police officers the Motor City is ripe for the picking. Officer Michael Crowder recently talked to National Public Radio as he patrolled one of the city’s more affluent neighborhoods. He talked about the very serious challenges Detroit police officers are facing these days. If you read American Police Beat you’re probably already aware of the fact that many officers working rural jurisdictions rely on public assistance to put food on the table for their families because their paychecks are so woefully inadequate. Crowder’s a local and has more than 16 years on the force. He says his local ties are too deep for him to ever even consider moving for a higher paying job. But that’s not true for the majority of cops doing the math on what they make and what they need. “I have a couple friends that have left, that have gone to different cities to work, because of the pay, the benefits. … A lot of our officers are working secondary employment, believe it or not,” Crowder told NPR. The Detroit Police Department has lost roughly 400 rank-and-file officers in the past half-dozen years because of budget cuts, attrition and early retirement. Lots of the people still remaining are valuable, experienced street cops according to Mark Diaz, president of the Detroit Police Officers Association. That makes Detroit a high value target for recruiters or headhunters as they’re sometimes called. “The Detroit Police Department has become a training ground for other municipalities, other law enforcement entities, because of the level of crime that our officers actually handle,” Diaz says. Agencies nationwide are looking to lure attractive candidates for sworn law enforcement positions. At a job fair in the Detroit suburb of Pontiac, Officer Mark Slade was promoting the benefits of a career with the Houston Police Department. One of Slade’s most effective pitches is the fact that senior rank-and-file officers in Houston can earn nearly $74,000 a year. In Detroit, patrol officers currently top out at about $47,000 a year. But things are tough all over and finding good people is a challenge. They’re out to get you – on tape.